Quito Day is celebrated in Ecuador on December 6, that is anniversary of foundation of the city in 1534. This is a public holiday, but it's celebrated on this level only in Quito, however, the holiday is important for all Ecuadorians. The origins of Quito date back to the first millennium, when the Quitu tribe occupied the territory of the present-day city. The Quitu were conquered by the Caras tribe, who later founded the Kingdom of Quito about 980 AD. The Kingdom consolidated with the Incan Empire and finally the indigenous people were conquered by Spanish conquistadors. The first Spanish settlement was Santiago de Quito, founded by Diego de Almagro on August 15, 1534. On August 28 it was renamed into San Fransisco de Quito and later moved to another location, where the present-day Quito is situated. This event took place on December 6, 1534. 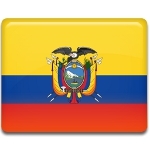 In 1830 Ecuador declared independence from Gran Colombia and Quito became the capital of the newly established state. Present-day Quito is the capital of Ecuador, and also its political, economic and cultural center. Quito is one of the most beautiful cities in South America. It's architecture comprises the elements of the Italian, Dutch and Spanish architectural styles. The historic center of the city became a UNESCO Cultural World Heritage Site in 1978.